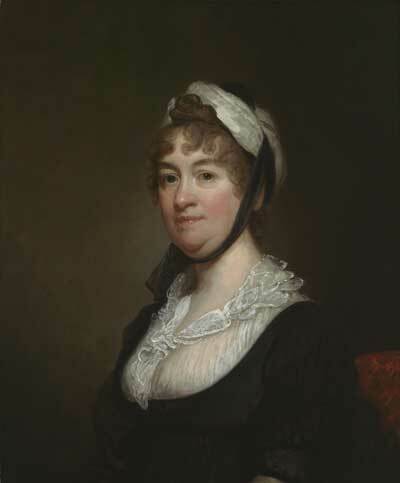 Elizabeth Bowdoin and her husband, Sir John Temple, had spent the Revolutionary War years in England, but returned when he was appointed first British consul general to the United States in 1785. This portrait of Bowdoin is one of several that Gilbert Stuart painted of members of her family, including her brother James Bowdoin III, the founder of Bowdoin College. The portrait was her gift to her daughter, Eliza Bowdoin Winthrop. Eliza mentioned the painting in an 1806 letter to her aunt: “Stuart has just finished my mother’s picture, which is an excellent likeness. He is also copying my father’s, and my mother gives them to me.” After completing this portrait, Stuart painted two additional versions.